We have been touch by the overwhelming amount of support everyone has shown us so far! So many of you followed along with our summer hosting journey and know a lot of the story but for those that do not we have it for you below! However since we are no longer allowed to share pictures or names we are using 'our boy' below when speaking about 'him'. If you are just joining our journey and would like to see pictures from our summer or would like to be updated about our journey please feel free to email me at ashleypethel@msn.com or find us on Facebook @ https://www.facebook.com/adamashley.pethel Thank you SO much in advance for everyones love and support!! I laughed it off and moved on never to give it much thought until Adam and I found ourselves on this journey and we have looked back on that memory in awe. We started this amazing journey off with our boys school hosting The Children’s World Choir and we were going to invite 2 of those boys into our home for the night. Auden and Asher were so excited! I was telling a close friend of mine about it one day over coffee and she told me that if they thought that was cool then I should look into the summer hosting programs she had always wanted to do but never did. I was intrigued, so we got the computer out and began to search for the program and eventually came to Kidsave (not the program she originally followed, but nonetheless I was intrigued)! We looked through their website and Facebook page together which is where I saw ‘our boys’ picture along with several other children that had been in the USA over Christmas. We looked through all of the children’s profiles together and I left that coffee shop that day not being able to get ‘our boy’ off my mind! I thought about him when I woke up and when I went to bed, I just needed to know more! I kept praying that the Lord would just clear my mind and make it go away but it wouldn’t. So I contacted the name listed under all the profiles and it just so happened that not only did she work for the adoption agency but she was also the family that had hosted ‘our boy’ that Christmas!! So after emailing her she called me to tell me all about ‘our boy’ which only made my heart want to explode more so LOTS more praying happened! I talked it over with my friend a LOT and she finally convinced me to talk to Adam about it! I just knew that he would immediately shoot the idea down as soon as I mentioned it so I prayed about it a lot more and finally felt it was time to ask him about it all. Once I finally told him I wanted to try to host ‘our boy’ over the summer I fully expected a “NO WAY!” Well I am here to tell you, when the Lord is in it He will work it all out! Adam did not say “No way” but rather “Okay, let’s look into it.” I was shocked and couldn’t wait to tell me friend and we both agreed that this was a certain sign that this was all in the Lord’s will! So from there things moved on, we contacted Kidsave to see what we needed to do to host ‘our boy’ and they informed us that since he had already been a part of the program once before that he wasn’t eligible and even so we were outside of their community so we were not eligible to host. Well don’t try to stand in the way of God’s plan, it is bigger than any rule that has ever been made! It wasn’t long before I was contacted and told that if we were willing to complete a full home study that they would make an exception to host pending the approval of Colombia and that we would need to pick him up from and take him back to Washington, DC. So, we agreed and started the procedure and as most of you know we were approved and were allowed to spend the most amazing 5 weeks with ‘our boy’ over the summer! We were all very excited and nervous when we arrived at the airport to pick him up! Imagine waiting anxiously to meet a child that the Lord has laid on your heart much like one that he has placed in your womb only this one can walk and talk but not in the same language as you. The children finally made it thru customs after a long 3 hours and we saw them coming through the airport, there was so much excitement but quickly that turned to awkwardness after about 5 minutes. We finally were allowed to leave and we headed to the car, my kids have never ridden in such silence! I quickly wondered what exactly had I done. We rode in silence for about 20 minutes to find a phone store for the chaperone that would be accompanying "our boy" for the 1st week. I waited outside with the boys and that was all it took to ease the tension…..they got out the soccer ball and that was it, the universal language of soccer began and the rest of the summer was history! From that point on you would have thought the 3 of them had been brothers since birth! We had the best summer filled with adventures, fun, learning and lots of laughter!! It was the fastest 5 weeks ever! When the time came to take ‘our boy’ back to the airport we all knew it was going to be a sad day, but nothing can prepare you for the feeling of watching the child that you know the Lord had sent to be yours walk away crying to get on a plane to another country and not knowing when or if you will be allowed to talk to him again. To add to the sadness it is very hard to watch your 10 year old and 7 year old try to fight back the tears to only give in and ask when or if they will see ‘our boy’ again! We prayed about the decision to adopt a lot but ultimately the decision was left to Adam and much to my surprise he started talking about adoption before I did, see they Lord works everything out when you seek Him to direct your paths! So here is where we continue to walk by Faith and believe that if the Lord favors it He will fund it!! Since we never planned to adopt we do not have money set aside for this very expensive process and are so graciously asking you to prayerfully consider helping us Bring ‘our boy’ Home! Every little bit helps and no amount is too small, it is ALL appreciated and even if you can’t financially help we covet your prayers!! Thank you all in advance for helping us run after the Lord’s will for our life and ‘our boys’!! Prayers and Blessings on this amazing journey!!! What a beautiful mission your are on and I am so happy to support bringing this child home to a loving family! So excited for you guys! Can't wait to see Juan come home! We can’t wait for your boy to come back to your family! Wishing you all the best as you go through this process! It's Giving Tuesday and I want to give to you because your family is so very giving of yourselves to bring 'your boy' home. He's going to be a happy boy to be a part of your family. 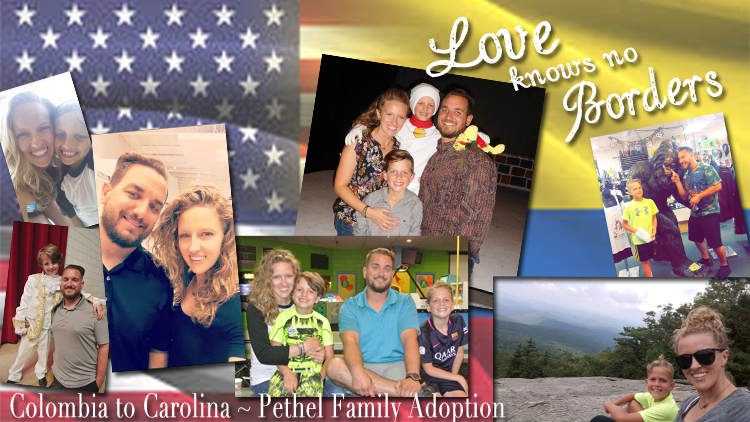 Team Beran Baby Katie & Trent are Adopting!